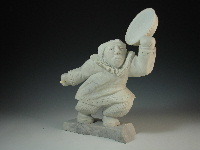 9.5cm L x 6.4cm W x 9.5cm H.
A truly outstanding piece from George Hitkolok. 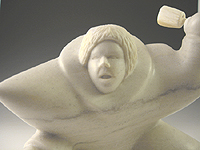 27.9cm L x 15.9cm W x 22.9cm H.
A most stunning piece -high in animation and detail and beautifully finished. 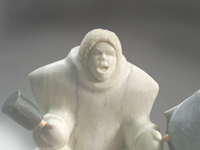 Traditional Drum Dancers in white stone are very difficult to find and highly valued. 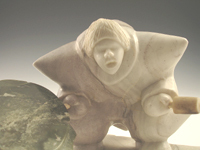 This dancer is carved out of an off-white stone and was purposely left in a semi-polished state by the artist to augment the natural veining in the stone. 18.4cm L x 11.4cm W x 15.0cm H.
heavily carved, stylized with flowing lines and wonderful symmetry.